Why did you use hearts on your symbols? Communication comes from the heart. When a child is born, the baby, mother and father begin communicating immediately, because of the love and bond that exists. Communication begins with love. Wouldn’t the world be lovely if every word spoken came from a place of compassion? Why are the words like “hi, bye, yes, no” not on Talk To Me 100 ®? We used words that would promote interactions, increasing turn taking between communication partners. While there are many words that we may use daily, they do not continue the conversation, words like yes and no do not usually foster interaction, I did not want a “yes/no” board. There are other ways to communicate these important words: eye gaze, head nods, vocalizations, gestures, signs, body language. How do I know if Talk To Me 100 ® is right for my child? If your child has difficulty expressing his basic needs, this tool is an excellent place to start. There are many outstanding resources available to guide parents, teachers and therapists. National and state organizations have extensive resources for the public. I have listed a variety of publications and websites to help your search for additional information. Your local public school district has programs in place to evaluate and provide individualized action plans for those that qualify. Can I use Talk To Me 100 ® with other devices or pictures? Talk To Me 100 ® is easy to use in combination with other voice output devices and visual strategies. For example, if your child is already using signs, pictures and multiple message voice output devices, this tool can be used in combination with them to reinforce target words. I encourage you to use the pictures or symbols that your child is already familiar with. If other symbols have been successful, create an overlay using the Talk To Me 100 ® template with your symbols and affix it to the Talk To Me 100 ® overlay. Photographs of target words like “mom, dad, home, friend, baby” may generate more interest and language production than the current symbols on the board. Use whatever visual symbols are appropriate for your individual needs. What does “follow the child’s lead mean”? Follow your child’s interest and action to begin your communication. If he only likes trains, then you get on his level and play with a train. Try to mirror his actions and vocalizations or words. Imitate his actions and words as closely as possible even if he appears not to pay attention to the partner. Over time, you should see an increase in attention and even imitation of your actions and words. How does repitition help language development? Research tells us the typically developing child listens to or “reads” his favorite books over 200 times each. This is critical for language development and emerging reading skills. Each time the reading is for a different purpose: looking at pictures, turning pages, listening to a specific word, hearing the melody of language, or the volume, colors, playing with the feel of a book in the hands or enjoying the interaction between the listener and reader. Our challenged children do not have these opportunities due to either physical, cognitive, visual, auditory or other sensory limitations. It is our fortune to find alternative ways to access these multisensory experiences for them to make the necessary neural connections in the brain. Reading, listening, singing and acting out nursery rhymes, songs, repetitive line stories all contribute to development of rich language experiences necessary for a healthy foundation for verbal expression. What if my child doesn’t like books? What are his interests? Select a book, or song, or rhyme that has the target preference. Combine the selection with a favorite toy, puppet or object that is featured in the phrases. WCreate your own book with photographs in an album. Add your own language. Persevere even though your child may appear to ignore these efforts. In time, you will begin to see increased participation with these activities. 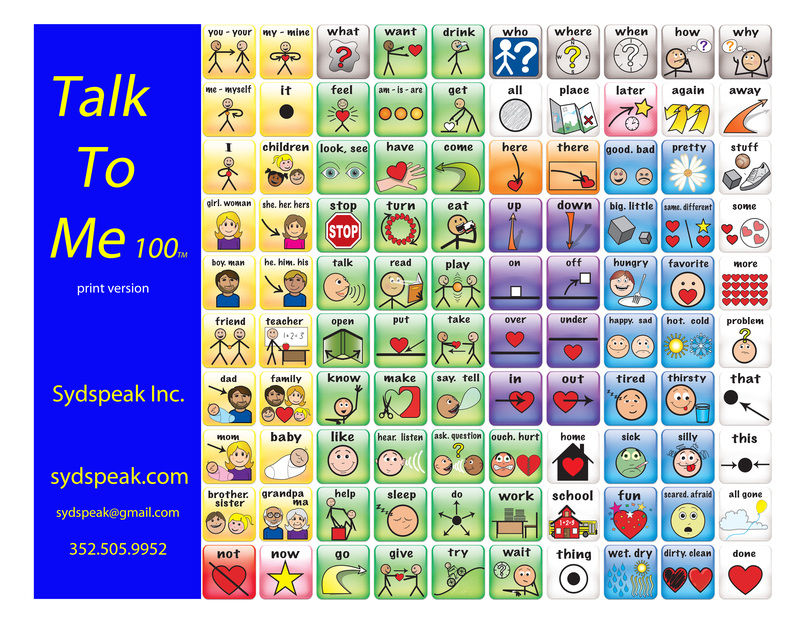 Should I use Talk To Me 100 ® if my child is already receiving speech and language therapy? Always consult your therapists and inform them of your home programs. Most therapists will welcome family participation and reinforcement of goals outside therapy. Therapists will be able to give you individualized recommendations based on progress in therapy and may increase rate of growth in language skills. Can anyone help a child to talk? You need to be a good listener, attentive, accepting, have time to spend and a genuine desire to interact. Any mature language partner can help another if they possess these qualities.